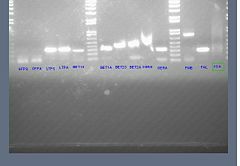 Did a second PCR/Purification of our allergen panel from Julia's arabidopsis genomic DNA. It worked! GFP didn't show up (first 2 lanes). The plants for the extraction weren't the GFP variety so this is expected. 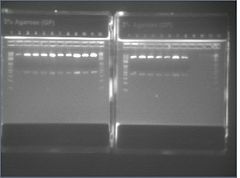 File:716pcrnewdnafail.jpeg PCR failure - no product. 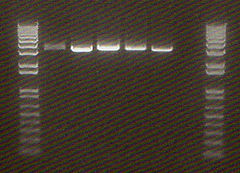 PCR using the newly extracted DNA was unsuccessful. Combined .5mL 80% glycerol with .5mL overnight cell culture of: Barnase 3 (number changed to Barnase 1 from miniprep onward), LacIN1, and Gal2. Did minipreps of the Mira/Brazz + Strep constructs. All constructs had failed to ligate. Re-digested STOP+V0120 BioBrick, gel purified. Gel Purification failed, no DNA was extracted. This page was last edited on 26 September 2017, at 19:17.